1. Toss the beef with 1 tbsp soy sauce and set aside. Bring a pan of water to the boil, add the noodles and simmer for 4 minutes. Add the courgette then immediately drain together in a colander. Cool under cold running water. Toss with 1 tsp oil. Mix the sauce ingredients with the remaining 2 tbsp soy. 2. Heat 1 tsp oil in a non-stick wok or frying pan, then, when very hot, add a third of the steak. Stir-fry for 1-2 minutes until dark golden and just pink in the middle, remove to a plate. Repeat twice, without using extra oil if possible. 3. Heat 1 tsp more oil then over a high heat stir-fry the peppers, onions and peanuts for 2 minutes until charred in places. 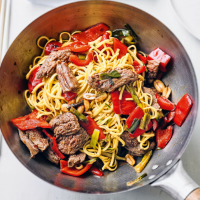 Add the Sichuan pepper and chillies, stir for 30 seconds, then return the beef, juices, the sauce and noodles to the pan. Cook for 1 minute, tossing carefully. Finish with a drizzle more oil if you like.